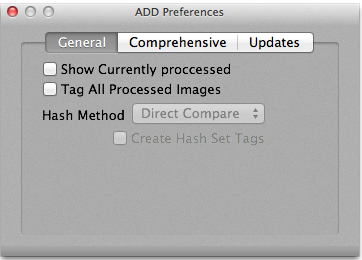 Do you use Aperture on your mac for your photos and images? 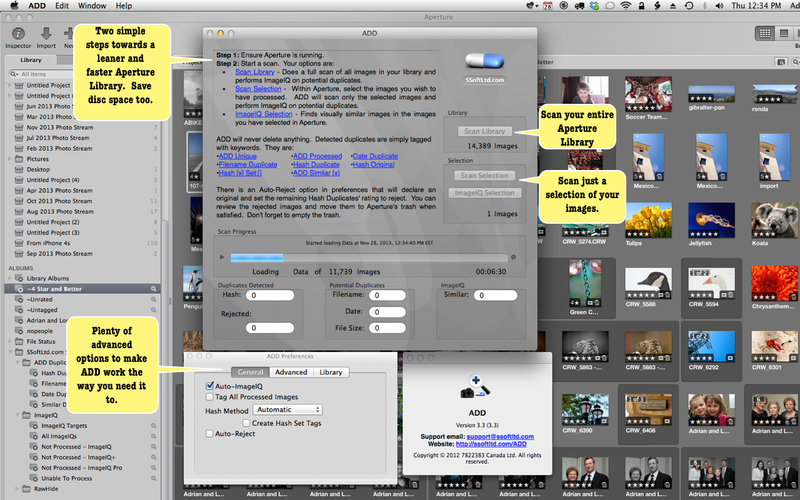 Do you have duplicate images sitting in your library? Enter Aperture Duplicate Detector. 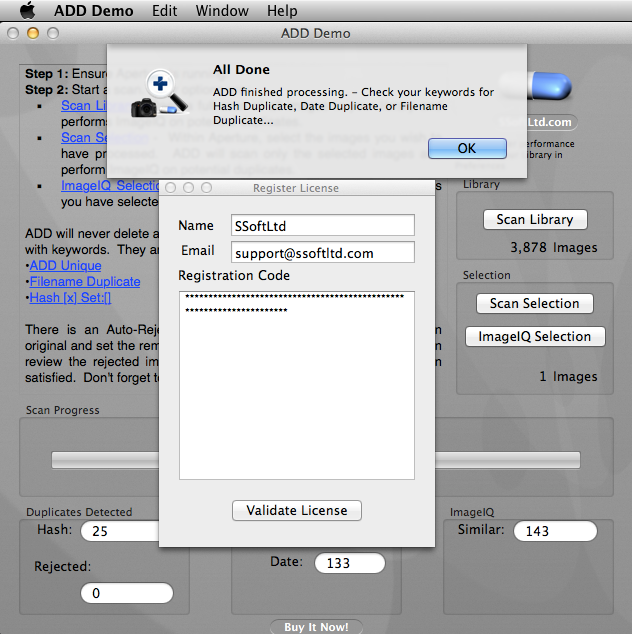 It is designed to work with Aperture 3.x and will scan your library for duplicates that have accumulated over time and waste hard drive space. ADD was designed from the ground up to be safe. Safe with respect to your images and the Aperture library. ADD uses only approved Apple APIs. It communicates directly with Aperture in order to get its job done; guaranteeing that there will be no “funny business”. We have not reverse engineered the Aperture database in order to achieve our goals. We certainly had the option to do that; but decided it was too risky of a proposition given that the structure changes with almost every update to Aperture. The APIs on the other hand have remained stable. 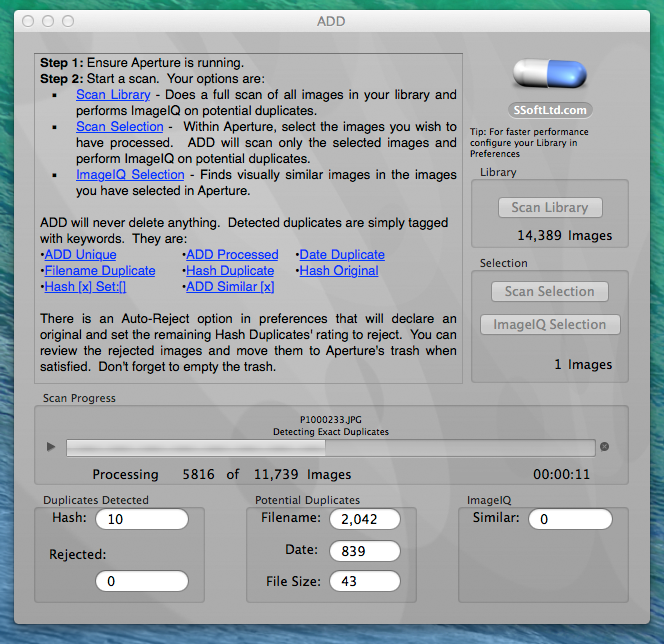 The bottom line is that ADD is the safest way available to remove duplicates from your library. √ Ultimate in safety. 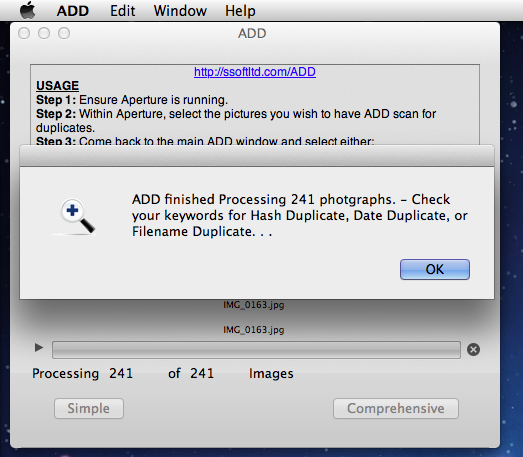 ADD only uses Aperture APIs to do its job. Basic usage guidelines are available here. We can also automatically generate some smart albums that are very appropriate for processing your duplicates. See this article for further details and instructions. Your photographs are precious, important, and valuable. This is why ADD won't delete anything without your consent. ADD does not know which is the original you want to keep. There are many reasons for this. Duplicates may be coming from different projects.... have different ratings.... different comments.... and so on. ADD does not want to make a decision about which one you want to keep as it would almost always be wrong for one person or another. That being said... there is an advanced option that will allow ADD to declare an original and set the rating of the rest to reject. This is disabled by default because of the risk of making the wrong decision as to what should be kept. If you are interested in this sort of automation and don't care about which of the duplicates is rejected have a look at this this tutorial. Visit the ADD Support Page. V3.4.5.1 Bug fixes including a Aperture communication timeout issue affecting only a few macs. 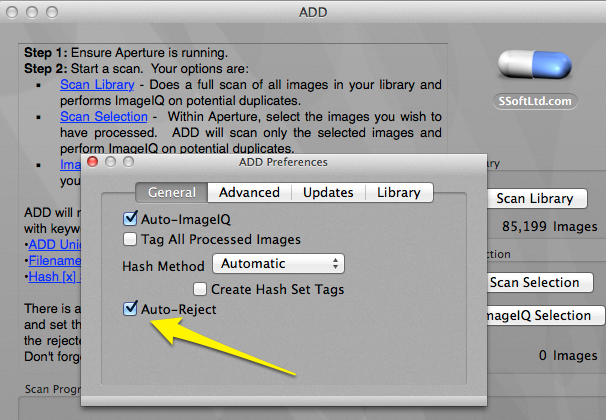 Removes restrictions on Aperture version for demo mode. V3.4.4 Bug fixes in propagating metadata which could cause a crash. V3.4.3 Bug fixes. 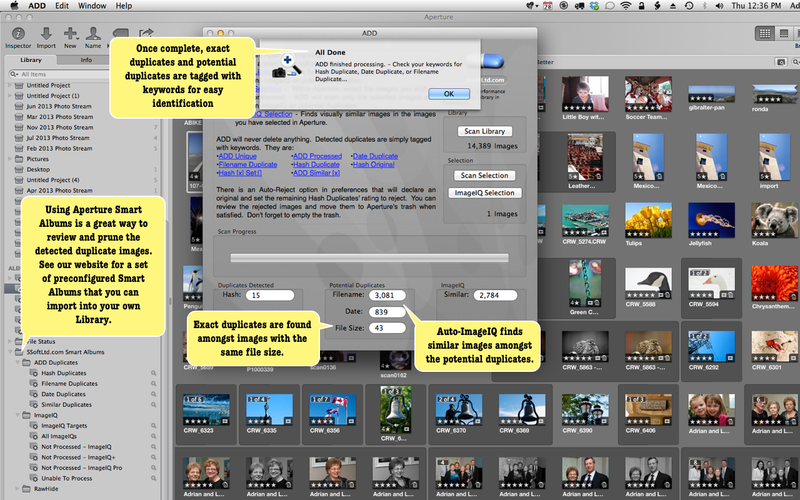 Fixes situation that prevented Lion users from using selection mode scans. Protects against rare crash during data loading stage when the library path is supplied. V3.4.1 New selection scan mode to compare selected images against entire library. Enhanced tooltips and help. Greatly enhanced performance when library path is supplied in options. Various bug fixes. V3.3 Prevents machine from sleeping while scanning. New ETA estimates and counter indicating potential number of exact duplicates. Bug fixes and stability improvements.